The gnocchi, assembled Roman style with farina rather than potatoes, are enriched with Parmesan and butter, cut into rounds, and then baked. Served piping hot atop bundles of asparagus, they seemed to welcome spring and acknowledge winter at the same time. For our main course, a veal ragout with spring vegetables and mushrooms served over rice, continued this theme. Lemon sorbet and prosecco parfaits with blueberries completed the meal. The delicious farina gnocchi can be cooked and shaped well in advance, so that all that is necessary is to pop them in the oven for a half hour. Count on only 10 minutes or less to roast the asparagus. This starter won great reviews from guests and will with yours too, whatever the weather! 1. Heat milk in a heavy, medium saucepan over medium heat until hot but not boiling. Reduce heat and whisk in farina, pouring it in a thin, slow stream and whisking steadily. Continue whisking until the mixture forms a thick mass, about 4 to 5 minutes. 2. Remove saucepan from heat, and using a wooden spoon stir in 1/3 cup of the Parmesan cheese, 2 tablespoons of the butter, 1/2 teaspoon salt, and the egg yolk. Continue to stir until all ingredients are well blended. The mixture will be quite thick. 3. Lightly moisten a large baking sheet or chopping board with cold water. 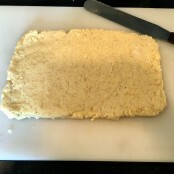 Using a metal spatula or a knife, spread farina mixture, in an even layer about 1/2 inch thick on sheet. Refrigerate until completely cooled, about 30 minutes. 5. To bake gnocchi, arrange a rack at center position, and preheat oven to 350 degrees F. Bake until gnocchi are golden brown on the bottom, 25 to 30 minutes. Check by lifting them up with a metal spatula. 7. While gnocchi are baking, spread asparagus on another baking sheet, drizzle them with olive oil, and toss to coat well. Season with salt and pepper. 8. When gnocchi are done, remove and cover loosely with foil. Raise oven temperature to 400 degrees F, and roast the asparagus until tender when pierced with a knife, 8 to 10 minutes. Turn them after 5 minutes. Remove and sprinkle with lemon juice and more salt if needed. 9. To serve arrange several asparagus spears on 6 salad plates. Place 4 gnocchi, slightly overlapping over the spears. Dust each serving with some of the remaining Parmesan cheese and with parsley. Serves 6. Note: Farina, also called cream of wheat, is usually located in the warm cereals section of the supermarket. Note: If you don’t have a cookie cutter, shape a heaping tablespoon of the mixture into a ball; then flatten it into a round shape. 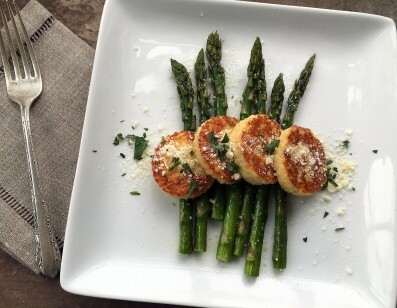 This entry was posted in Food News and tagged asparagus, gnocchi, romana, Spring, winter by brosbottom. Bookmark the permalink. Looks good. Loved the potato puree with broccoli..a real hit! Thanks so much, and I’m glad you liked that potato puree with the broccoli. I made it for Easter.